Are you a l337 keyboard shortcut maniac? Do you wish you could access menu items using a spotlight/quicksilver like interface? Well now you can! Press CMD + SHIFT + /, and on most leopard applications the Help menu will show up, with a spotlight-like box in focus immediately. 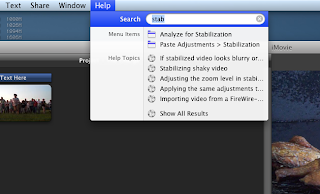 Start typing what you want to find like "stabilization" for getting at the Analyze for Stabilization in iMovie '09, and items that match the text will show up in the window. This trick is also great for finding filters and tools in photoshop that you can’t remember the shortcuts to. I'm going to feature some more tricks for keeping you productive and happy, stay tuned!